Dr. Julio Acosta was born and raised in Caracas, Venezuela, where he grew up with his siblings and attended school. In 1992, Dr. Acosta obtained his medical degree at the "Universidad Central de Venezuela” in Caracas, and later in 1998, that of Cardiologist at the “Hospital Dr. Domingo Luciani” also in Caracas. In early 1999, he went to Madrid, Spain, where he completed postgraduate training in interventional cardiology at “Hospital Gregorio Marañón”. He returned to Venezuela at the end of 2000 and started a private practice at “Policlínica Metropolitana” in Caracas. 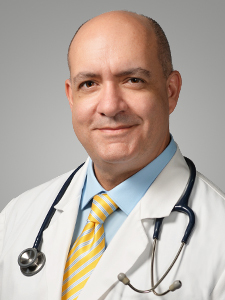 Dr. Acosta had always been an active participant in the academic activities of the Venezuelan Society of Cardiology and The Society of Interventional Cardiology, both of which he is a member, as speaker and symposium coordinator in national meetings and as speaker in several international meetings. In 2006, Dr. Acosta married his wife Mariana, and now they have three daughters: Sarah, Emiliana and Juliana. In 2015, he and his family relocated to Dominican Republic where he founded and directed two units of non-invasive cardiology studies and joined the Cardiology staff at National Institute of Cancer (INCART) in Santo Domingo. In August 2018, Dr. Acosta and his family moved to Nassau, where he has joined the medical staff at the Bahamas Heart Centre as Interventional Cardiologist. Here, he says, he has found an extraordinary and pleasant island, where he can easily enjoy his favorite hobby… walking on the beach with his daughters.